Google's updated Transparency Report reveals rights holders are filing millions of take-down request each week in their campaign to remove access to material deemed infringing on copyright. For the first six months of 2013, over 100 million removal requests have been filed - double the number for all of 2012. Removed links do not appear in Google's search index, making it harder for users to find the material they look for. Links for file-sharing and Bittorrent tracker sites such as Filestube and Torrentz.eu are the most targeted by rights holders with hundreds of thousands of requests filed last month for each site. The top three reporting organisations are Degban, an adult content provider representative body, and music industry organisations British Recorded Music Industry and Recording Industry Association of America. Last month, the three accounted for just under seven and a half million removal requests. The removal requests are considered and acted upon as a requirement under the United States Digital Millennium Copyright Act (DMCA) law. This provides protection for providers who remove infringing content and links leading to such material. 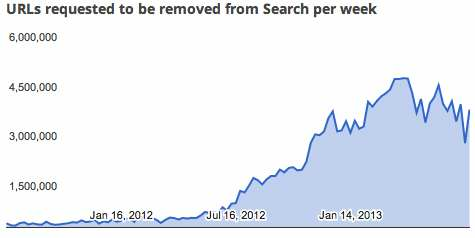 According to Google, in past years the company has acted on 97 per cent of link removal requests, often taking them out in six hours. The search giant said it receives inaccurate and unjustified copyright removal requests "from time to time". It cited a major United States movie studio that asked for the removal of an Internet Movie Database (IMDB) page for a movie it had released as well as the official trailer that was posted on "a major authorised online media service". Earlier this week, anti-piracy organisation LeakID, acting on behalf of Microsoft, was found to have filed requests for the removal of six links to Microsoft's own store, support pages and product descriptions, file sharing news site TorrentFreak reported.